Any dental treatment especially root canal is done not to cause pain but actually cure it. Yes, it used to be painful but with modern technology and anesthetics the treatment is just as easy as getting a filling done. In fact the only pain that exists is in the mind/perception of the patient. A person who has actually gone under the treatment will actually describe it as painless. The pain that has been caused by the damage done to the pulp area, nerves or any other core part of the teeth by the bacteria is cured by the root canal treatment. Root canal is a process to treat all the damage that has been done to the teeth. Its duration depends on the damage done and other health factors of the patient. What matters is the effectiveness of the treatment and restoration of the teeth. These days, there are root canal specialists who take maximum of 2 appointments usually to complete the treatment. This is one of those illogical beliefs that have managed to survive, even though it is based on the research done centuries ago. Dr Price in 1920s conducted a study to prove that tooth extraction is a better option than root canal. Except Dr. Price, no other study has proven/supported this myth. In fact root canal successfully removes all the bacteria that are present in the core area of the tooth and prevents the patient from major oral and overall health problems. Pain in the affected tooth is one of the symptoms of the infection, but not the only symptom. In fact there may be some cases in which the infection has led to death of the teeth. So there won’t be pain but infection will still persist. There are many reliable ways such as temperature testing, percussion testing and pulp vitality machine to see if the tooth is really dead but still in need of a treatment. 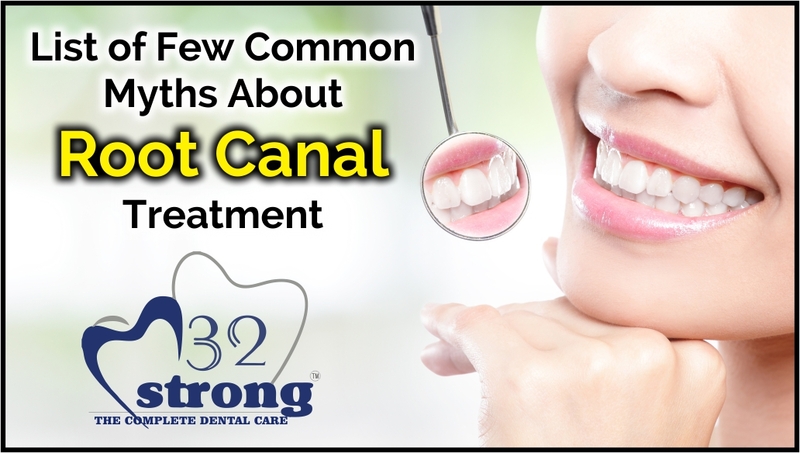 One of the most common misconceptions that people have that root canal has short term benefits. This gained popularity when people started experiencing problems like tooth ache and crooked tooth shortly after getting the treatment done. If the treatment has been completed successfully and the teeth has been restored using a perfect fit and crowned then with just practicing good oral habits , you will make sure that the restored teeth is as good as new. Tooth extraction is one of the most uncomfortable dental procedure. Tooth extraction should be in fact the last alternative. Treatments like bridges, implants are more costly and time consuming than a simple root canal treatment. Saving the natural teeth at any cost should be the aim of any dentist. So instead of reading and believing in these popular myths, get a grip on reality. Any kind of tooth pain should not be ignored and should be consulted with a painless root canal specialist in Delhi. Along with this practice basic oral hygiene habits like brushing at least twice in a day, using a floss and mouth wash, and consuming a balanced and nutritious diet will make sure you never have to complain about tooth ache ever again.